I loathe self proclaimed experts. People who claim to be experts are usually just as lost as the rest of us, but they have figured out a way to sell that to us. If you hear an expert introduced, count to ten and you will probably hear a sales pitch coming your way. I don’t even like self-help books for the same reason, although I will admit to being suckered into one every now and then. With that said, I am no expert. This blog is not intended to be authoritative (unless you’re a publisher, if so, give me a call and I’ll give you my credentials.) The truth is I love to write and need the practice. I also love being married. Since my wife and I have been married for many years now, I thought it might be fun to pass along the few lessons I have learned to my fellow travelers on this journey of matrimony. Hidden within the last paragraph is today’s topic – Anniversary Snares. (The fact that spell check just corrected my misspelling of “anniversary” should emphasize how deeply disturbing the topic can be to any husband.) Notice that I mentioned my wife and I have been married for “many years.” I’m not trying to hide anything there, I was being intentionally vague. Rule one is never give specifics about your anniversary unless you are backed into a corner. 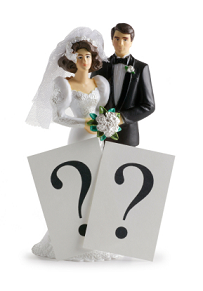 If the topic of your marriage comes up, have a few vague answers ready. If you can slide some flattery in it will increase the odds that you will not be cornered for specifics. Here is an example: “Marriage to Kristy is so wonderful that years seem like mere days.” Take note to include your wife’s name in the statement if possible. While you can get by without remembering specifics of your anniversary, it is a requirement that you remember your wife’s name. You might as well make it known that you have met the minimum requirement. Also notice how the sentence deflects the conversation to “days” and not years. You want to make sure that your statement does not end with the word “years” as the next logical question will be “So, how many years has it been?” Phrases such as “time stands still” will help to signal your listener away from specifics about time or date. It is important that you stick to this rule – even if you think you know the exact date of your marriage! One thing newlywed husbands sometimes fail to notice is that there is no correct answer to the question “How long have you been married?” The reason for this is that women change the answer. Because men often think in a linear, problem-solving fashion, we tend to believe that the answer to the question should be easily calculated by some difference between the current date and the oft-forgotten date of our marriage. We are wrong. Women apparently track time along an emotional and creative time line which can cause the answer to fluctuate, creating a 99.9% chance that the answer will be something other than what you say it is. So what do you do when you are finally cornered and asked for specifics? Even your best deflective vagueness will occasionally be challenged by one of your friends wives. I have never witnessed this, but I am certain that wives give each other high-fives when one of them corners a spouse with the “how long” question. I imagine they have a secret pact to do this as often as possible, but I digress. I actually have several strategies that you can employ for this situation, but I think they warrant their own post. Do you have any deflective and vague sentence suggestions that husbands can use? Or perhaps a horror story of being cornered with the “how long” question?